Benalmadena is a town situated between Fuengirola and Torremolinos, with plenty of great beaches and a wide variety of accommodation for the tourists. In Benalmadena we’ll find a large amount of pubs and restaurants for all tastes, as well as Puerto Marina and is divided in three main urban centres: Benalmadena Costa, Benalmadena Pueblo and Arroyo de la Miel. Puerto Marina and the Solymar square give Benalmadena a wide range of possibities to entertain ourselves, have a coffe, go for a walk or go out partying.The Solymar square has recently been reconstructed and there is now a nice shopping centre. Furthermore, Benalmadena has several tourist attractions like the Sealife aquarium or the Tivoli World amusement park in Arroyo de la Miel. In Benalmadena we’ll also find a wide hotel offer, highlighting the Hotel Torrequebrada that has a golf course, casino, restaurants and shows. Benalmadena Costa is a family tourist destination, where we can enjoy the beach and Benalmadena Pueblo, that still maintains its Andalusian village charm and is situated in the top part of the municipality, with breath-taking views over the whole coast. The first human presence in Benalmadena, that we know of, dates back to the upper Paleolithic (around 20.000 years ago), period in which numerous settlements have been found along the Costa del Sol. In Benalmadena these remains were found in the Cueva del Toro (Mount Calamorro). From this period, there are numerous remains that we can visit in Benalmadena’s Archaeological Museum. The first urbanised areas were only small villages and settlements at the beginning of the 10th century with the arrival of the Muslims. One century after, Benalmadena Pueblo becomes the centre of the population and the beginning of a social structure due to the construction of a fortress and a walled village. The name of “Benalmadena” comes from this period, originally from the Arabic “Ibn-al-Madena” (sons of the mines), due to the mines of iron and ocher present in the locality. After the Christian re-conquest came the darkest period for Benalmadena, where almost all the architectonic remains were destroyed. The weather in Benalmadena is magnificent like on the whole Costa del Sol, enjoying around 300 days of sun a year and an average annual temperature of 20ºC. During the summer months (July and August) the temperatures increase considerably (sometimes over 40ºC), so we strongly recommend always having a cold bottle of water nearby to cool off and keep hydrated. The sea temperature is cold all year round, except for one week in August in which the temperature of the water is quite warm. Reaching Benalmadena from any point of the Costa del Sol is easy, and if we arrive at Malaga airport and drive our hired car to Benalmadena, it shouldn’t take us more than 10 or 15 minutes, depending on the traffic. Use the controls to move around the Map of Benalmadena and the zoom tool to enlarge it. You can also change the type of view to satellite or terrain. Benalmadena and Torremolinos are next to each other, and being considered the touristic heart of the Costa del Sol, have fantastic access by road and train. Malaga International Airport, located five miles southwest of Malaga, is a busy airport by many regular international flights and charter flights. The airport has a railway station linking Malaga city and Benalmadena. Taking a bus from malaga airport to Benalmadena may not be the most convenient method of transportation if you have a lot of luggage; there are a few bus stops in Benalmadena, one of them is at Puerto Marina, where you also can link with Estepona and Marbella buses. The bus for Benalmadena is next to the San Miguel Factory, outside of the airport. You can take a Taxi at Malaga airport to Benalmadena, and the aproximate cost is 15€. There is a train station with trains from Malaga airport to Benalmadena every 30 minutes. Its accesible upstairs by crossing the bridge out of the airport, not recommended for disabled people. Malaga car hire may be a nice and cheap option if you also plan to visit Malaga. Transfers from Malaga airport to Benalmadena is a fast and confortable way if you don´t need to rent a car. Continue reading in how to get to Benalmadena, it could be of help if you are looking for the road route, and if you still have questions don´t hesitate in contacting us in the malaga transfers forum. In Benalmadena we can find one of the biggest and most important centres on the Costa del Sol to go out for a drink or dancing. Puerto Marina has many different atmospheres and plenty of pubs and discos where a multitude of nationalities go out to have a great time each summer. The nights in Benalmadena are expensive, and the pubs and discos in Benalmadena are often restrictive. A vodka or whiskey with Redbull for example can cost us a minimum of 10 or 12€, which is why the locals normally buy the alcohol in the shops and gather together to drink in the street first, before going into the clubs. Getting to Puerto Marina is simple, if we’re driving along the coast we’ll see a sign indicating the turnoff as soon as we reach the Solymar square. 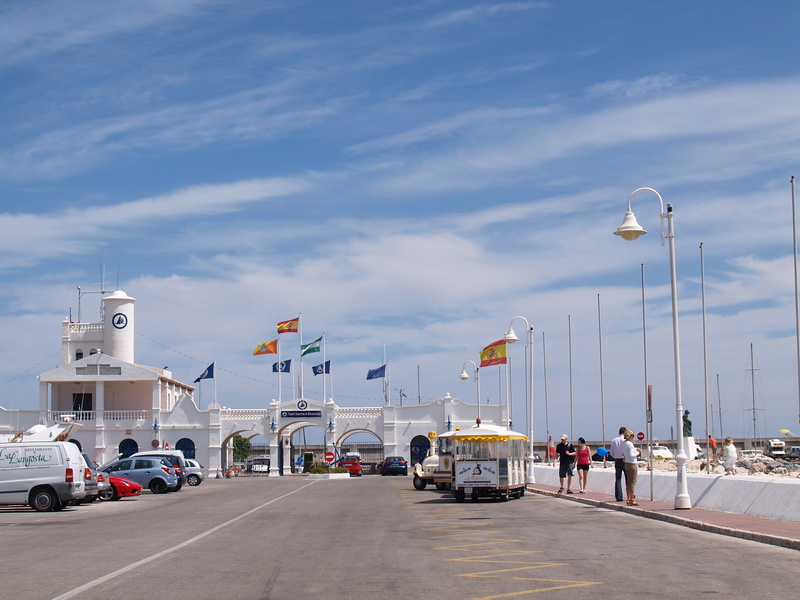 The Costa del Sol seafront can be done walking, and from Benalmadena we can choose two directions. If we have plenty of energy we can get to Fuengirola or, on the other hand, we can go for a shorter walk to Torremolinos, finding several shops, ice-cream parlours and cafes right by the beach along the way. In some strategic points on the coast of Benalmadena and on the Costa del Sol we’ll spot a few Arab watchtowers. Hotel Riu Puerto Marina - 4 stars, located nearby Puerto Marina. 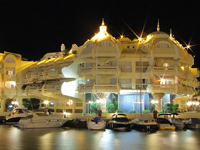 We hope you enjoy our suggestions of 4 and 5 star hotels in Benalmadena. Looking for an apartment in Benalmadena? For more information use this link for Benalmadena Apartments. Arroyo de la Miel is the economic centre of town, where is concentrated the bulk of the population and municipal services and where we will find the train station for getting to Malaga or to Fuengirola by train. 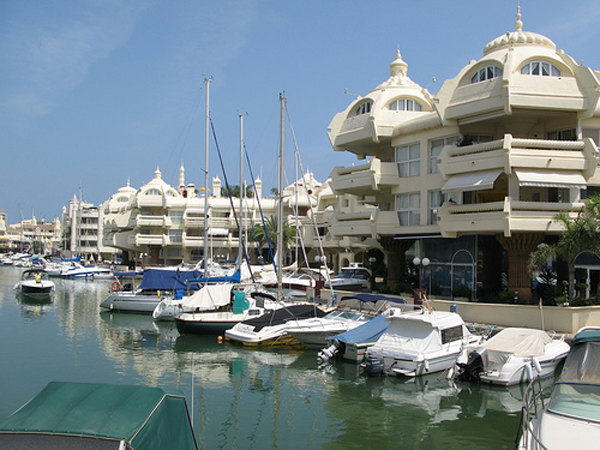 Benalmadena Costa is known for being the most cosmopolitan area, as here is concentrated the largest tourism offer, with hotels, an outstanding marina, casino and shops of all kinds. Next to the beach, you can visit the Castle Bil-Bil, an Arabic style building, which is flanked by fountains and is decorated according to Nazari tradition. Another building of great interest is the Castle of Colomares, which is dedicated to the discovery of America. This construction combines all architectural styles, creating a great visual impact. An example of a day in Benalmadena would be a beach day as in the video above, and strolling to the Benalmadena park before getting to your hotel in Benalmadena and getting ready for going at night to Puerto Marina. 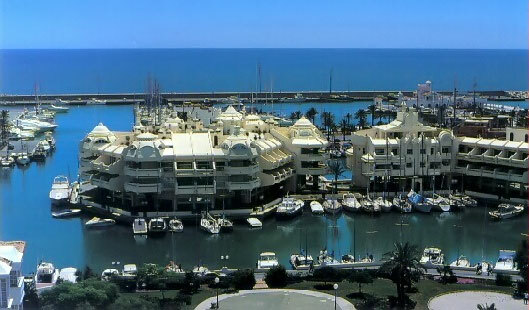 There are many things to do in Benalmadena, and that was an example which came to my mind based on my preferences. 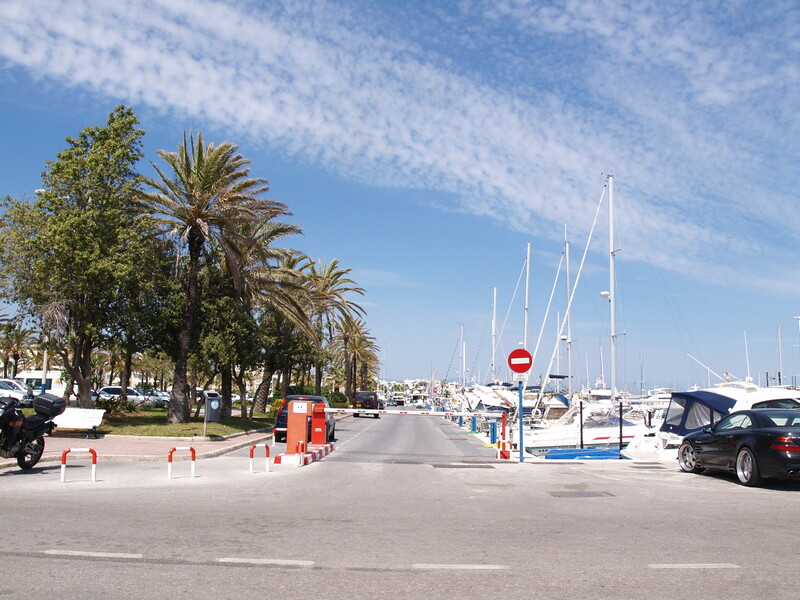 Puerto Marina is perfectly connected to the Costa del Sol on the Mediterranean motorway (AP-7, N-340). The train, with a stop in Arroyo de la Miel, connects the area with Fuengirola, Torremolinos, the airport and Malaga city, while from the railway station to the marina there is a distance of 2,4 km ( half an hour walking) and thatfore might be recommendable a car. Benalmadena has a total of 17 beaches. The eastern beaches are large and are very well equipped, while the western beaches are rocky and mostly quiet, so they are perfect for fishing or sports such as diving. Santa Ana beach has a length of 500 meters and an average width of 20 m. High grade of occupation in urban area and seafront promenade. It has a moderate swell. There are signs of danger, surveillance equipment, the red cross and rescue team. It is easily accessible on foot and by car or bus. Parking area. Disabled access. It has a tourist information office, toilets, showers, phone, bins, cleaning services, rental of umbrellas and hammocks. 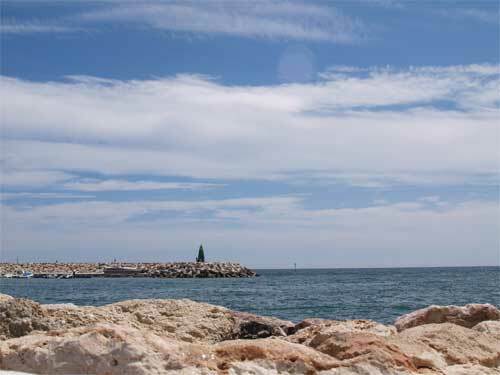 Melilleros: It is one of the most beautiful beaches of Benalmadena, especially by the curious sea inlet that is formed and which divides the beach into two zones. The large sand area is usually frequented by young people. La Perla: Very small beach located between two artificial breakwaters. Las Yucas: Small beach of sand and gravel. 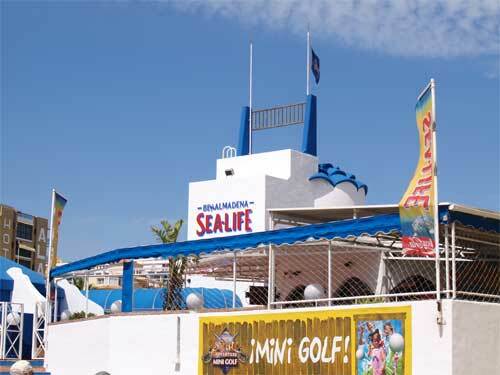 Bil Bil: Along with the beach at Arroyo de la Miel, it is a popular place along the sea promenade of Benalmadena. Arroyo de la Miel: Along with the Bil Bil beach, this is a popular area with a high level of services. Arroyo Hondo: Beach with large influx of people, next to Hotel Costa Azul. Torremuelle beach: Narrow beach between the residential areas of Valdeconejos and La Hidalga. La Morera: A small beach that, despite having a considerable influx is the most quiet of the area, as it is a little bit away from the more urbanized areas. Tajo de la Soga: Small beach with a considerable influx and a high level of services. Carvajal: Well equipped beach, surrounded by high buildings. It has a high level of occupancy. The beach at Carvajal is an urban beach with excellent services, including yacht rental, hire of sun loungers and parasols. Ideal for a family day. 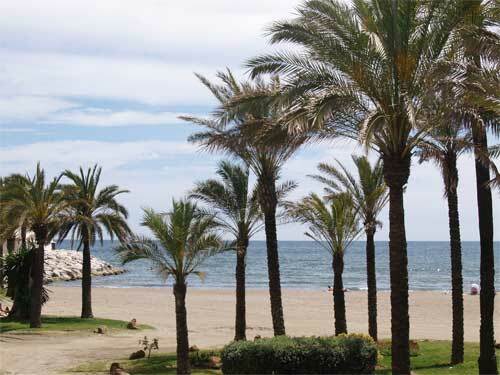 Malapesquera: Malapesquera beach is one of the venues for the summer in Benalmadena. Besides the presence of up to four Beach bars, there are volleyball nets and goalposts to practice football on the beach. Its huge size makes it an ideal place to celebrate from children´s games to Jet Ski races. There are also showers and a large area for sun beds and umbrellas. Fuente de la Salud beach: To the east of the town, bordering with Torremolinos and next to the Marina. Its name is rooted in a drinking water source to which are attributed healing properties. Initially it was a rocky beach and almost devoid of sand. After the construction of the existing Marina, the beach was formed. Benalnatura: As its name suggests, Benalnatura is a nudist beach, giving total freedom to all those who want to take a sun bath water without swimming trunks. Pictures below are some of the images you can find in our Benalmadena gallery. 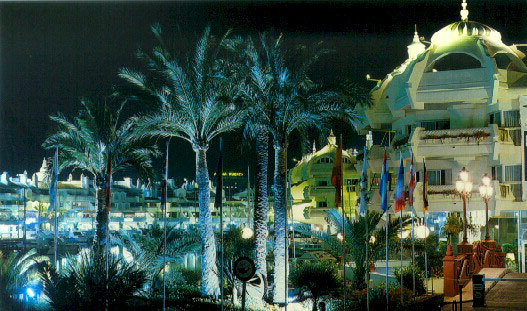 Benalmadena is maybe the ideal place for many of the tourists who like to enjoy the nightlife. This munincipality is very popular so beaches are crowded, take it in consideration if you are looking for a quiet holiday place.